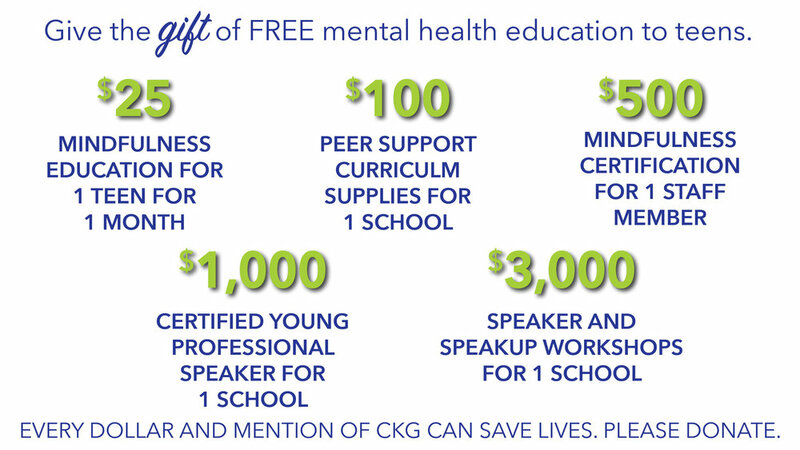 A gift to the Cameron K. Gallagher Foundation will help fund our mission to raise awareness of teenage depression and anxiety, and to fund our FREE mental health programs for central Virginia teenagers. All donations to the CKG Foundation are tax deductible. If you have questions about your gift or about how to give, please contact our Director of Grants and Finance, Missy Minton: missy@ckgfoundation.org or call our office at (804)528-5000. Thank you for your support!